For further details on discovering longitude, see History of longitude. To determine a position on the Earth's surface, it is necessary and sufficient to know the latitude, longitude, and altitude. Altitude considerations can naturally be ignored for vessels operating at sea level. Until the mid-1750s, accurate navigation at sea out of sight of land was an unsolved problem due to the difficulty in calculating longitude. Navigators could determine their latitude by measuring the sun's angle at noon (i.e., when it reached its highest point in the sky, or culmination) or, in the Northern Hemisphere, to measure the angle of Polaris (the North Star) from the horizon (usually during twilight). To find their longitude, however, they needed a time standard that would work aboard a ship. Observation of regular celestial motions, such as Galileo's method based on observing Jupiter's natural satellites, was usually not possible at sea due to the ship's motion. The lunar distances method, initially proposed by Johannes Werner in 1514, was developed in parallel with the marine chronometer. The Dutch scientist Gemma Frisius was the first to propose the use of a chronometer to determine longitude in 1530. The purpose of a chronometer is to measure accurately the time of a known fixed location, for example Greenwich Mean Time (GMT). This is particularly important for navigation. Knowing GMT at local noon allows a navigator to use the time difference between the ship's position and the Greenwich Meridian to determine the ship's longitude. As the Earth rotates at a regular rate, the time difference between the chronometer and the ship's local time can be used to calculate the longitude of the ship relative to the Greenwich Meridian (defined as 0°) using spherical trigonometry. In modern practice, a nautical almanac and trigonometric sight-reduction tables permit navigators to measure the Sun, Moon, visible planets, or any of 57 selected stars for navigation at any time that the horizon is visible. The creation of a timepiece which would work reliably at sea was difficult. Until the 20th century, the best timekeepers were pendulum clocks, but both the rolling of a ship at sea and the up to 0.2% variations in the gravity of Earth made a simple gravity-based pendulum useless both in theory and in practice. Christiaan Huygens, following his invention of the pendulum clock in 1656, made the first attempt at a marine chronometer in 1673 in France, under the sponsorship of Jean-Baptiste Colbert. In 1675, Huygens, who was receiving a pension from Louis XIV, invented a chronometer that employed a balance wheel and a spiral spring for regulation, instead of a pendulum, opening the way to marine chronometers and modern pocket watches and wristwatches. He obtained a patent for his invention from Colbert, but his clock remained imprecise at sea. Huygens' attempt in 1675 to obtain an English patent from Charles II stimulated Robert Hooke, who claimed to have conceived of a spring-driven clock years earlier, to attempt to produce one and patent it. During 1675 Huygens and Hooke each delivered two such devices to Charles, but none worked well and neither Huygens nor Hooke received an English patent. It was during this work that Hooke formulated what is known as Hooke's Law. The first published use of the term was in 1684 in Arcanum Navarchicum, a theoretical work by Kiel professor Matthias Wasmuth. This was followed by a further theoretical description of a chronometer in works published by English scientist William Derham in 1713. Derham's principal work, Physico-theology, or a demonstration of the being and attributes of God from his works of creation, also proposed the use of vacuum sealing to ensure greater accuracy in the operation of clocks. 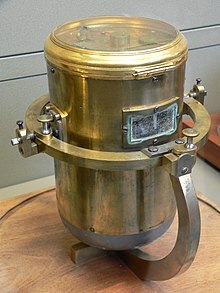 Attempts to construct a working marine chronometer were begun by Jeremy Thacker in England in 1714, and by Henry Sully in France two years later. Sully published his work in 1726 with Une Horloge inventée et executée par M. Sulli, but neither his nor Thacker's models were able to resist the rolling of the seas and keep precise time while in shipboard conditions. In 1714, the British government offered a longitude prize for a method of determining longitude at sea, with the awards ranging from £10,000 to £20,000 (£2 million to £4 million in 2019 terms) depending on accuracy. 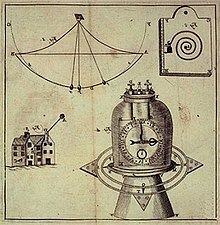 John Harrison, a Yorkshire carpenter, submitted a project in 1730, and in 1735 completed a clock based on a pair of counter-oscillating weighted beams connected by springs whose motion was not influenced by gravity or the motion of a ship. His first two sea timepieces H1 and H2 (completed in 1741) used this system, but he realised that they had a fundamental sensitivity to centrifugal force, which meant that they could never be accurate enough at sea. Construction of his third machine, designated H3, in 1759 included novel circular balances and the invention of the bi-metallic strip and caged roller bearings, inventions which are still widely used. However, H3's circular balances still proved too inaccurate and he eventually abandoned the large machines. Harrison solved the precision problems with his much smaller H4 chronometer design in 1761. H4 looked much like a large five-inch (12 cm) diameter pocket watch. In 1761, Harrison submitted H4 for the £20,000 longitude prize. His design used a fast-beating balance wheel controlled by a temperature-compensated spiral spring. These features remained in use until stable electronic oscillators allowed very accurate portable timepieces to be made at affordable cost. In 1767, the Board of Longitude published a description of his work in The Principles of Mr. Harrison's time-keeper. John Harrison's H1 marine chronometer of 1735. Drawings of Harrison's H4 chronometer of 1761, published in The principles of Mr Harrison's time-keeper, 1767. Ferdinand Berthoud marine chronometer no.3, 1763. In France, 1748, Pierre Le Roy invented the detent escapement characteristic of modern chronometers. In 1766, Pierre Le Roy created a revolutionary chronometer that incorporated a detent escapement, the temperature-compensated balance and the isochronous balance spring: Harrison showed the possibility of having a reliable chronometer at sea, but these developments by Le Roy are considered by Rupert Gould to be the foundation of the modern chronometer. The innovations of Le Roy made the chronometer a much more accurate piece than had been anticipated. Pierre Le Roy marine chronometer, 1766. Photographed at the Musée des Arts et Métiers in Paris. Harrison's Chronometer H5 of 1772, now on display at the Science Museum, London. Ferdinand Berthoud in France, as well as Thomas Mudge in Britain also successfully produced marine timekeepers. Although none were simple, they proved that Harrison's design was not the only answer to the problem. The greatest strides toward practicality came at the hands of Thomas Earnshaw and John Arnold, who in 1780 developed and patented simplified, detached, "spring detent" escapements, moved the temperature compensation to the balance, and improved the design and manufacturing of balance springs. This combination of innovations served as the basis of marine chronometers until the electronic era. The new technology was initially so expensive that not all ships carried chronometers, as illustrated by the fateful last journey of the East Indiaman Arniston, shipwrecked with the loss of 372 lives. However, by 1825, the Royal Navy had begun routinely supplying its vessels with chronometers. It was common for ships at the time to observe a time ball, such as the one at the Royal Observatory, Greenwich, to check their chronometers before departing on a long voyage. Every day, ships would anchor briefly in the River Thames at Greenwich, waiting for the ball at the observatory to drop at precisely 1pm. This practice was in small part responsible for the subsequent adoption of Greenwich Mean Time as an international standard. (Time balls became redundant around 1920 with the introduction of radio time signals, which have themselves largely been superseded by GPS time.) In addition to setting their time before departing on a voyage, ship chronometers were also routinely checked for accuracy while at sea by carrying out lunar or solar observations. In typical use, the chronometer would be mounted in a sheltered location below decks to avoid damage and exposure to the elements. Mariners would use the chronometer to set a so-called hack watch, which would be carried on deck to make the astronomical observations. Though much less accurate (and expensive) than the chronometer, the hack watch would be satisfactory for a short period of time after setting it (i.e., long enough to make the observations). Although industrial production methods began revolutionizing watchmaking in the middle of the 19th century, chronometer manufacture remained craft-based much longer. Around the turn of the 20th century, Swiss makers such as Ulysse Nardin made great strides toward incorporating modern production methods and using fully interchangeable parts, but it was only with the onset of World War II that the Hamilton Watch Company in the United States perfected the process of mass production, which enabled it to produce thousands of its Hamilton Model 21 and Model 22 chronometers of World War Two for the United States Navy & Army and other Allied navies. Despite Hamilton's success, chronometers made in the old way never disappeared from the marketplace during the era of mechanical timekeepers. Thomas Mercer Chronometers still makes chronometers to the present day. Without their accuracy and the accuracy of the feats of navigation that marine chronometers enabled, it is arguable that the ascendancy of the Royal Navy, and by extension that of the British Empire, might not have occurred so overwhelmingly; the formation of the empire by wars and conquests of colonies abroad took place in a period in which British vessels had reliable navigation due to the chronometer, while their Portuguese, Dutch, and French opponents did not. For example: the French were well established in India and other places before Britain, but were defeated by naval forces in the Seven Years' War. The most complete international collection of marine chronometers, including Harrison's H1 to H4, is at the Royal Observatory, Greenwich, in London, UK. The crucial problem was to find a resonator that remained unaffected by the changing conditions met by a ship at sea. The balance wheel, harnessed to a spring, solved most of the problems associated with the ship's motion. Unfortunately, the elasticity of most balance spring materials changes relative to temperature. To compensate for ever-changing spring strength, the majority of chronometer balances used bi-metallic strips to move small weights toward and away from the centre of oscillation, thus altering the period of the balance to match the changing force of the spring. The balance spring problem was solved with a nickel-steel alloy named Elinvar for its invariable elasticity at normal temperatures. The inventor was Charles Édouard Guillaume, who won the 1920 Nobel Prize for physics in recognition for his metallurgical work. The escapement serves two purposes. First, it allows the train to advance fractionally and record the balance's oscillations. At the same time, it supplies minute amounts of energy to counter tiny losses from friction, thus maintaining the momentum of the oscillating balance. The escapement is the part that ticks. Since the natural resonance of an oscillating balance serves as the heart of a chronometer, chronometer escapements are designed to interfere with the balance as little as possible. There are many constant-force and detached escapement designs, but the most common are the spring detent and pivoted detent. In both of these, a small detent locks the escape wheel and allows the balance to swing completely free of interference except for a brief moment at the centre of oscillation, when it is least susceptible to outside influences. At the centre of oscillation, a roller on the balance staff momentarily displaces the detent, allowing one tooth of the escape wheel to pass. The escape wheel tooth then imparts its energy on a second roller on the balance staff. Since the escape wheel turns in only one direction, the balance receives impulse in only one direction. On the return oscillation, a passing spring on the tip of the detent allows the unlocking roller on the staff to move by without displacing the detent. The weakest link of any mechanical timekeeper is the escapement's lubrication. When the oil thickens through age or temperature or dissipates through humidity or evaporation, the rate will change, sometimes dramatically as the balance motion decreases through higher friction in the escapement. A detent escapement has a strong advantage over other escapements as it needs no lubrication. An impulse from the escape wheel to the impulse roller is nearly dead-beat, meaning little sliding action needing lubrication. Chronometer escape wheels and passing springs are typically gold due to the metal's lower slide friction over brass and steel. Chronometers often included other innovations to increase their efficiency and precision. Hard stones such as ruby and sapphire were often used as jewel bearings to decrease friction and wear of the pivots and escapement. Diamond was often used as the cap stone for the lower balance staff pivot to prevent wear from years of the heavy balance turning on the small pivot end. Until the end of mechanical chronometer production in the third quarter of the 20th century, makers continued to experiment with things like ball bearings and chrome-plated pivots. Marine chronometers always contain a maintaining power which keeps the chronometer going while it is being wound, and a power reserve to indicate how long the chronometer will continue to run without being wound. Marine chronometers are the most accurate portable mechanical clocks ever made, achieving a precision of around a 0.1 second per day or less than one minute per year. This is accurate enough to locate a ship's position within 1–2 miles (2–3 km) after a month's sea voyage. In strictly horological terms, "rating" a chronometer means that prior to the instrument entering service, the average rate of gaining or losing per day is observed and recorded on a rating certificate which accompanies the instrument. This daily rate is used in the field to correct the time indicated by the instrument to get an accurate time reading. Even the best-made chronometer with the finest temperature compensation etc. exhibits two types of error, (1) random and (2) consistent. The quality of design and manufacture of the instrument keeps the random errors small. In principle, the consistent errors should be amenable to elimination by adjustment, but in practice it is not possible to make the adjustment so precisely that this error is completely eliminated, so the technique of rating is used. The rate will also change while the instrument is in service due to e.g. thickening of the oil, so on long expeditions the instrument's rate would be periodically checked against accurate time determined by astronomical observations. Ships and boats commonly use electronic aids to navigation, mostly the Global Navigation Satellite Systems. However celestial navigation, which requires the use of a precise chronometer, is still a requirement for certain international mariner certifications such as Officer in Charge of Navigational Watch, and Master and Chief Mate deck officers, and supplements offshore yachtmasters on long-distance private cruising yachts. Modern marine chronometers can be based on quartz clocks that are corrected periodically by GPS signals or radio time signals (see radio clock). These quartz chronometers are not always the most accurate quartz clocks when no signal is received, and their signals can be lost or blocked. However, there are quartz movements, even in wrist watches such as the Omega Marine Chronometer, that are accurate to within 5 or 20 seconds per year. At least one quartz chronometer made for advanced navigation utilizes multiple quartz crystals which are corrected by a computer using an average value, in addition to GPS time signal corrections. ^ Sobel, Dava. Longitude: The True Story of a Lone Genius Who Solved the Greatest Scientific Problem of His Time. Penguin Books. pp. 56, 57. ISBN 0-14-025879-5. Dismissing other solutions to the longitude problem, Thacker wrote "In a word, I am satisfied that my Reader begins to think that the Phonometers, Pyrometers, Selenometers, Heliometers and all the Meters are not worthy to be compared to my Chronometer"
^ Heath, Byron (19 March 2018). "Discovering the Great South Land". Rosenberg. Retrieved 19 March 2018 – via Google Books. ^ Matthews, Michael R. (31 October 2000). "Time for Science Education: How Teaching the History and Philosophy of Pendulum Motion Can Contribute to Science Literacy". Springer Science & Business Media. Retrieved 19 March 2018 – via Google Books. ^ "isbn:0330532189 - Google Search". books.google.com. Retrieved 19 March 2018. ^ Koberer, Wolfgang (May 2016). "Notes: On the First Use of the Term "Chronometer"". The Mariner's Mirror. United Kingdom: Society for Nautical Research. 102 (2): 203–205. ^ Harrison, John; Maskelyne, Nevil; Great Britain. Commissioners of Longitude (19 March 1767). "The principles of Mr. Harrison's time-keeper; with plates of the same". London, Printed by W. Richardson and S. Clark and sold by J. Nourse. Retrieved 19 March 2018 – via Internet Archive. ^ a b Macey, Samuel L. (19 March 1994). "Encyclopedia of Time". Taylor & Francis. Retrieved 19 March 2018 – via Google Books. ^ Usher, Abbott Payson (19 March 2018). "A History of Mechanical Inventions". Courier Corporation. Retrieved 19 March 2018 – via Google Books. ^ Landes, David S. (1983). Revolution in Time. Cambridge, Massachusetts: Belknap Press of Harvard University Press. p. 165. ISBN 0-674-76800-0. Pierre Le Roy had developed the detached spring detent escapement around 1748, but abandoned the concept. ^ Macey, Samuel L. (19 March 1994). "Encyclopedia of Time". Taylor & Francis. Retrieved 19 March 2018 – via Google Books. ^ Hall, Basil (1862). "Chapter XIV. Doubling the cape (from "Fragments of voyages and travels", 2nd series, vol. 2 (1832))". The Lieutenant and Commander. London: Bell and Daldy (via Project Gutenberg). OCLC 9305276. Retrieved 2007-11-09. ^ Golding Bird (1867). The Elements of Natural Philosophy; Or, An Introduction to the Study of the Physical Sciences. J. Churchill and Sons. p. 545. Retrieved 2008-09-24. ^ Tony Jones (2000). Splitting the Second. CRC Press. p. 121. ISBN 0750306408. ^ Nathaniel Bowditch, Jonathan Ingersoll Bowditch (1826). The New American Practical Navigator. E. M. Blunt. p. 179. ^ Norie, J. W. (1816). "To Find The Longitude of Chronometers or Time-Keepers". New and Complete Epitome of Practical Navigation. Archived from the original on 2015-09-07. ^ "International Convention on Standards of Training, Certification and Watchkeeping for Seafarers, 1978". Admiralty and Maritime Law Guide, International Conventions. Retrieved 2007-09-22. ^ "International Convention on Standards of Training, Certification and Watchkeeping for Seafarers (with amendments)". International Maritime Organization. Archived from the original on 2007-07-03. Retrieved 2007-09-22. ^ Montgomery, Bruce G. "Keeping Precision Time When GPS Signals Stop". Cotts Journal Online. Archived from the original on 2011-06-09. Retrieved 2007-09-22. ^ "Precise Time and Frequency for Navy Applications: The PICO Advanced Clock". DoD TechMatch, West Virginia High Technology Consortium Foundation. Archived from the original on December 31, 2010. Retrieved 2007-09-22. Wikimedia Commons has media related to Marine chronometers. This page was last edited on 16 March 2019, at 10:56 (UTC).